Mazda sees the combustion engine as a core technology. 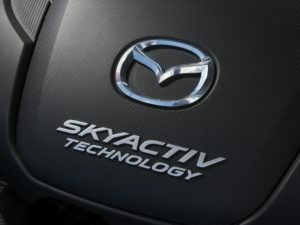 A spokesperson for the carmaker said well-to-wheel CO2 emissions (taking production and distribution of the fuel into account) from its 2.0-litre Skyactiv-G petrol engine are around 142g/km, compared to 128g/km for an electric vehicle at the same power level, the latter using power generated from a typical mix of sources. In turn, this would mean a 10% improvement in CO2 emissions for future petrol engines could enable them to potentially match an electric vehicle. A 30% improvement in fuel economy compared to today’s engine technology could bring well-to-wheel CO2 emissions beneath that of an EV using energy produced using liquefied natural gas (LNG) – the cleanest form of electrical generation at the moment, at 100g/km on a well-to-wheel basis. However, it’s worth noting that this isn’t based on country-specific data; the SMMT’s recent ULEV report saying there was a lack of industry consensus on well-to-wheel figures here, due to the high number of variables involved. Reckoning that at around 80% of cars on the roads by 2035 will still have a combustion engine, Mazda is targeting ongoing improvements for both its petrol and diesel units. Its view is that it’s best to improve the baseline technology before adding electrification. Skyactiv-X petrol engines, which use a compression combustion similar to a diesel engine, are due in 2019, while new Skyactiv-D diesels will follow in 2020. These will be accompanied by different grades of electrification; mild hybrids from 2019, plug-in hybrids from 2021 onwards, and fully electric vehicles before the end of this decade, developed in partnership with Toyota and Denso. Mazda’s aim is a 50% improvement in fuel economy by 2030, compared to 2010 levels, and a 90% improvement by 2050. These will be through a combination of better engine technology and progressive electrification, tailoring the product offer to local demands and incentives.